Anatolia the Fire Goddess is an international belly dancer, fire dancer and artist based out of NYC and Paris. The Fire Goddess weaves a spectacular story with her technique, creativity and skill. Running both group, duo and solo shows, she is notorious for her unique style and custom props and costumes. Some of which include a ten foot golden fire dress (tanora), fire isis wings, crystal ball contact juggling and magnetic fire masks. Her truly one of a kind acts have been performed from India to Egypt. Blending traditional and fusion belly dance styles; what she likes to call "Neo-Cabaret" Anatolia never leaves room for a dull moment. Anatolia is a dynamic public figure, featured in Rolling Stones Magazine, Entertainment Weekly, VH1's Who was I in HightSchool and much more. Her performances ranges from corporate, children's parties to runways shows. Hired for fashion week, Wadsworth Atheneum Museum of Art, Dance of Vice, Tumblr, Google,Yale secret society, WhistlePig Whiskey, Fireball Whiskey, Trinity College and Countless corporate events, colleges and high school event. Anatolia the fire goddess has a number of fire shows ranging in production scale and size. She specializes in both large dramatic fire shows to small sensual fire shows perfect for indoor locations and fine dinning atmosphere. Production size can be anything From multiple international performers, perfect for cooperate and stage shows, to so solo fire shows perfect for back yard parties. Fire shows are diverse in theme; Hula Fire Show, Rocco Fire Show, Dark Circus Fire Show, Game of Thrones Fire Show, Belly Dance Fire Show and Masquerade Fire Show. Along with official shows there is also the option of hiring interactive roaming/roving with fire masks, crowns and wings. The belly dance fire show is ideal for indoor tight locations. For indoor fire show special fuels are used, that do not set off smoke alarms, making it safe for most indoor locations. The belly dance fire show uses dynamic fire acts paired with belly dance to create a sensual and mystical production. Show runs between 20 to 30 min long, after the show interactive dance or photos with fire crowns and wings are ussally included in the show. This show is the perfect balance of sensuality and thrills. This international show, based out of Paris, is a two part production. Let the Rococo girls create a world of Versailles with all the glamour of Maria Antoinette. 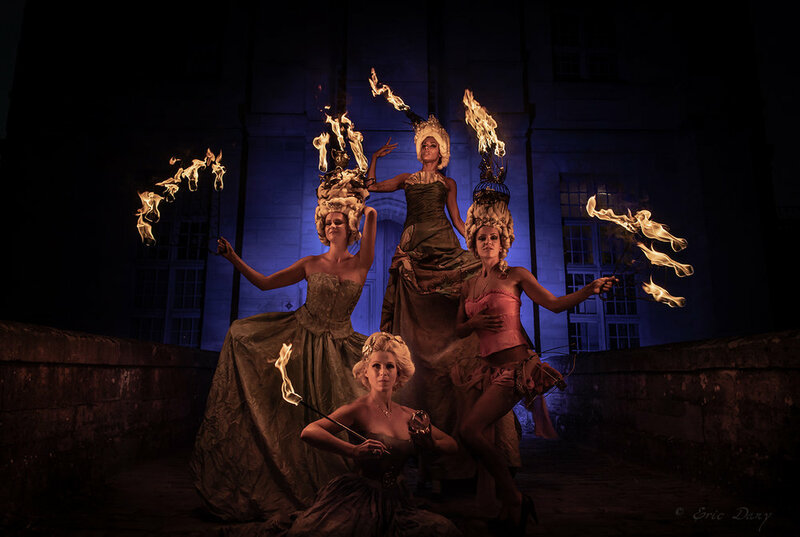 Dressed in billowing fire retardant gowns and fire proof crowns they illuminate the night as they meander the party as moving sculptures. Posing for pictures with guest and creating an atmosphere of Creme De La Creme high fashion. This Roving portion will transform any party to feel like the Petite Palace of Trianon. After hours the Maria Antoinette fire show tells the story of the back room the ‘Boudoir’. Billowing dresses unravel unveiling stockings, and corsets. 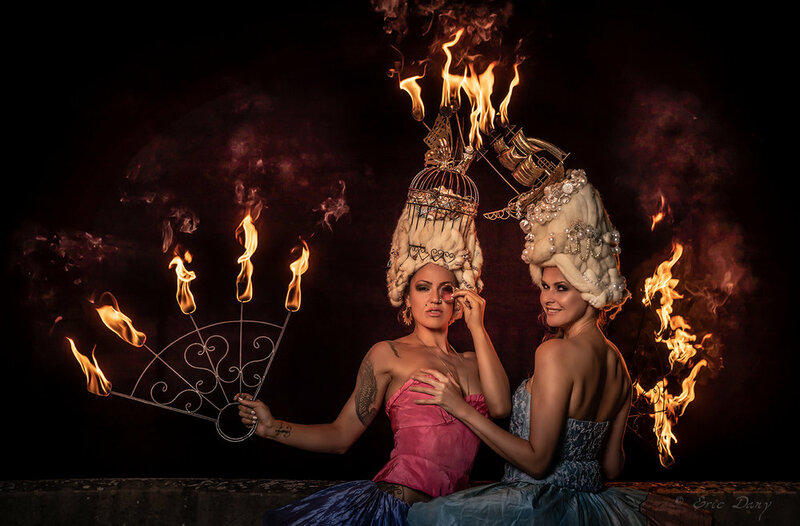 A dynamic group or solo fire show unfolds, embodying the world of Maria Antoinette. Follow her journey as she tells a story of fantasy in her attempted to ignore the cruelaties of the world around her that eventually consumes her world entirely. Aloha! Take a journey with us to the islands. Explore the mystery and mythologies of the gods goddesses. Watch as their story plays out with fire and Dance. Anatolia teams up with Kalani a renowned Polynesian dancer. With their combined skills they offer a family friendly and jaw-droping show. 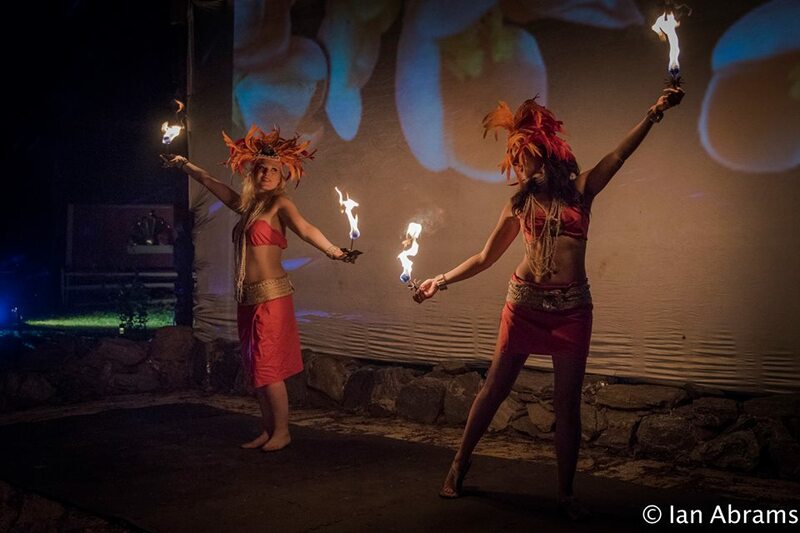 45min to an hour long hula fire show combines interact dance, story telling and fire from the island. Although offered separate solo shows, one can book a hula dance show or a fire show, the combination is recommended for anything from a backyard family get-together to a corporate gathering. Kalani and Anatolia also offer leis greeting before the show, this Hawaiian greeting is the perfect way to start off the party. The Dark Circus and Halloween fire show are great family friendly shows. They are similar, only with a slight difference in costume and musicality. The Dark circus show has a steampunk feel and focuses on a basic circus fire show. While the Halloween show is done to Halloween songs, such as Halloween, night mare on elm and much more this is a fun show for the whole family. Mardi Gras, Old Hollywood, Bollywood, game of thrones and other themed fire shows. Some shows projection display have been made to go with the party. This creates a unique an truly thrilling evening of entertainment! These include, Hula Fire Show, Belly Dance Fire Show, Indian Jones Show, Halloween Show. If booking a projection fire show one can also watch movies afterwards. Please keep in mind that bookings need to be done in advance. The Belly Dance Illusion show is broken down into three slightly different shows. A change with music selection and costume, present a slightly different variation between the three. Mystical Muses (east meets west fusion), Hip-Notic (Reassance feel and theme) and the standard Belly Dance Magic Show (Glamour, a Showgirl Vegas style show). Each show weaves together magic and belly dance to create a truly one of a kind form of entertainment that will mystify and amaze your audience! Unraveling dresses unveil dancers, magic canes paired with sassy drum solo, Levitation and gyration, dancing on and with swords, and much more! This show is sure to amaze! Ruffled feathers, green, blue shimmering jeweled costumes create a spectacular entrance even before the show! Because the peacock costumes and one thousand feathered head pieces are so elaborate we now offer roaming/roving with guest before or after the show to offer ambiance and photo opportunities. The show itself has an classical Indian vibe with dance choices and music selection. Its a perfect fit for a Bollywood themed party! Show is between 25 to 45min long, depending on if the client choices to have interactive dance (dance lesson) or add on another performer. This belly dance magic show has a Renaissance theme and feel. Metallic, jeweled costumes, golden crowns and not to mention mesmerizing and dangerous acts. This show never leaves room for a dull moment! Featuring one of a kind belly dance sword acts, crystal levitation and much more. Perfect for day time and night time events, family, corporate and public festivals. Show length between 25 to 45min deepening on amount of performers an if the client chooses to have interactive dance (small dance lesson) after the show. Anatolia offers ambiance circus entertainment. Roaming or Roving is a great way to entertain guest while they mingle at the party or event. Anatolia works with Gregoire a stilt walkers. Together they offer three themes to provide something fun and pleasing for the eyes. Strips, top hats, and a harlequin look, this is great way to entertain any circus themed party or event. Gregoire provides stilt walking entertainment as the ringmaster while Anatolia provides illusion and contact juggling at a Harlequin. An old world feel, Gregoire and Anatolia provide a circus fusion with billowing dresses and a French Flair. This theme works great for any party or event that wants a Rocco flair, Masquerade entertainment, or to just bring some class to ones event. This ice look can be booked with a fire and ice themed party, all white party or much more!! Anatolia specializes in weaving the flow-arts/Fire-Dancing with belly dance. She offers an intro to fire dance class, plus belly dance with fire fans class. Also, contact juggling with belly dance. Anatolia offers group and one on classes. Please send over an email if you are interested in learning how to fire dance, belly dance or contact juggle.